It’s a beautiful day in Central Washington – why not spend the afternoon on a motorcycle? Before you head out, read our Ellensburg client’s message about motorcycle safety. Many motorcycle enthusiasts claim it’s the wind in their hair, the sense of freedom and the independence they feel that compels them to ride again and again. 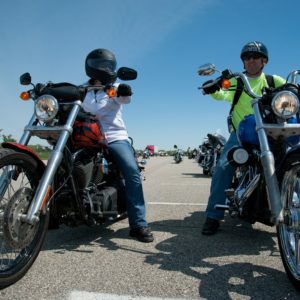 Despite the fun, the reality is that motorcycle accidents are all too common, due to hazardous road conditions, the negligence of inattentive drivers on the road, or those who simply may not see a motorcycle due to its small size. And, when motorcycle accidents do occur, they tend to result in more severe, life-threatening injuries than those involved in auto accidents. According to the Washington Traffic Safety Commission, there were 402 serious injuries and 73 deaths involving motorcyclists in Washington state during 2015. Those numbers were up from the previous year, during which there were 361 serious injuries and 69 deaths involving motorcyclists. And, sadly, fatalities involving motorcyclists continue to rise. Knowing the risks inherent in motorcycle travel, two bike enthusiasts from Ellensburg, Heather and Les Jones, decided to take action. The couple each decided to become safety instructors to help other riders understand the rules of the road and ride more safely. In an August 12, 2017 article in the Ellensburg Daily Record, Heather explained how she was thrown from her motorcycle after being struck by a vehicle in September 2015. Despite months of pain and rehabilitation following the accident, Heather’s joy of riding and her desire to educate others about road safety helped her heal both mentally and physically, and return to riding. To discuss your motorcycle accident with an experienced Abeyta Nelson Injury Law attorney, please contact us. We’d be happy to discuss your case.